Yiqu (simplified Chinese: 义渠; traditional Chinese: 義渠; pinyin: Yìqú; Wade–Giles: I-ch'ü; Old Chinese: /*ŋ(r)aj-s [ɡ](r)a/, or simplified Chinese: 仪渠; traditional Chinese: 儀渠; pinyin: Yíqú; Old Chinese: /*ŋ(r)aj [ɡ](r)a/), was an ancient Chinese state which existed during the Zhou dynasty in what is now eastern Gansu and northern Shaanxi. It was inhabited by a people who were called the "Yiqu," by contemporary writers, whom modern scholars have attempted to identify as one of the non-Han peoples on the fringes of the Zhou territories, such as the Rong, Di, or Qiang. Contemporary textual evidence for the Yiqu is sparse, beginning only with the foundation of the state of Yiqu in the late eighth century BCE. It lasted approximately four-and-a-half centuries, until its end in the early third century. However, the origins of the Yiqu people as descendants of other "non-Huaxia" Chinese peoples have been traced to the Shang dynasty on the basis of textual scholarship and archaeological evidence, although this remains controversial (see "Ethnic identity of the Yiqu"). Around 720 BC, the Yiqu Rong migrated eastwards. Indeed, this is the first mention of Yiqu in textual sources. At this time, the Zhou kings had been weakened by war and natural disasters. 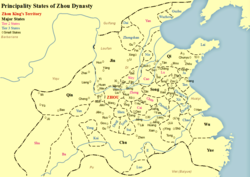 In 770 BC, Ping, King of Zhou had moved the capital east to Chengzhou in present-day Luoyang, Henan, and royal authority had been weakened. So began the Spring and Autumn period. According to The Treatise on the Western Qiang in the Book of the Later Han, "During the late reign of King Ping, Zhou was undergoing decline. The Rong harried the many Xia from Mount Long to the east. Up until the Yi and Luo Rivers, the Rong were everywhere. Thereupon, there were for the first time Di, Huan, Kai, and Ji Rong in the Wei River valley, there was the Yiqu Rong in [the lands] north of the Jing River, and there were the Dali Rong in Luochuan. "[nb 1] King Ping died in 720 BC, which means that the state of Yiqu was founded no earlier than that year. From this source it is clear that the Yiqu were considered one of the peoples called "Rong", a kind of warlike foreigner. For the remainder of the Spring and Autumn period, contemporary sources are silent on Yiqu. However, approximately forty years intervened before the final destruction of Yiqu. In 311 BC, a few years after Qin took twenty-five cities from Yiqu, King Hui died. His son became King Wu of Qin, who attacked the Yiqu in the second year of his reign. However, he died just three years later, in 307 BC. It was not until the late reign of King Zhao of Qin that the Yiqu were destroyed. Historians have analysed this as part of a power struggle in the Qin court, with the Queen Dowager on one side, and the King on the other. When King Zhao came to power, he was but a boy, so his mother, Queen Dowager Xuan, served as regent. However, though the King grew older, the Queen Dowager kept control. She had the support of a powerful minister and three generals inside the court, and the support of the Yiqu King outside it. The Queen's need for a backup force against her son may be why the Yiqu were spared for a while. After Qin destroyed Yiqu, it established commanderies and set up counties in the Yiqu territories, and the Yiqu Rong became subjects of Qin. Qin then built "long walls" to protect against other peoples in these new territories. During the Western Han, there were still references to "Yiqu" but these were in the general sense of "barbarian", not in specific reference to the people of the former state of Yiqu. Some members of the Yiqu people took Yiqu as their clan name. Others, descending from Yiqu nobility, took Gongsun (Chinese: 公孫; pinyin: gōng sūn; literally: '"noble son"') as their clan names, and became generals. Aside from these fleeting references, the Yiqu disappear from the historical records during the Han dynasty. The Wei, Jing, and Luo rivers. The Xianyun, ancestors of the Yiqu, lived in the upper reaches of the Jing and Luo rivers. It is not known exactly how many cities the Yiqu built in their lands; from the number of cities cited which were taken by Qin according to historical texts, they may have numbered over twenty. Not much is known about the culture of the Yiqu. The fact that the Yiqu leader is called "king" (Chinese: 王; pinyin: wáng) suggests a degree of political sophistication above a tribal chief. What is more likely is that they were an agricultural people. The fact that they were settled in cities indicates that they must have had agriculture to support themselves. This sets the Yiqu apart from the nomadic "non-Huaxia" Chinese peoples of East Asia, such as the Xiongnu. Moreover, the fact that pottery objects and bricks (possibly used to build a palace) were discovered at the remains of the Yiqu capital further suggests a developed material culture. The similarities of the type of bricks here and those excavated from remains of cities in other states of Zhou (such as Wei, Qi and Chu) may suggest a degree of trade between Yiqu and its neighbours. In the pre-Han era, nomadic agriculturalists and pastoralists were considered alien peoples, whose history can be only tentatively traced through written sources and archaeological finds. Written sources identify the Yiqu a part of the Rong as the "Yiqu Rong" (Chinese: 義渠之戎; pinyin: yìqú zhī róng). [nb 7] However, it cannot be said for certain that the Yiqu were a "Rong" people, or that there was a common "Rong" identity. Scholarly consensus has it that "Rong" was used ambiguously in Chinese sources as a blanket term for the various alien peoples around the Zhou territories, with no particular ethnic connotation. Furthermore, the Xianyun may be linked to the Siwa culture in the Tao River basin in what is now eastern Gansu, which dates to approximately the 14th century BCE, which some scholars believe is the remains of a Di branch of the Qiang. Indeed, the word "Yiqu" borrowed into ancient Chinese with the characters "義渠" (Old Chinese: /*ŋ(r)aj-s [ɡ](r)a/) may be an Old Qiang toponym meaning "Four Waters", which corresponds to the four rivers which meet at the old Yiqu capital at present-day Miaojuping. However, evidence for this is based on alleged correspondence between the unattested Old Qiang language and Amdo Tibetan,[nb 8] which is spoken in southern Gansu, and the assumption of a close relationship between these Tibetan speakers and the ancient Qiang and Rong, which cannot be firmly verified. Sinologist Edwin Pulleyblank argued that the Xiongnu who later established the first nomadic empire on the Eurasian steppe were part of the Yiqu people, before the Qin general Meng Tian drove them north out of the Ordos region in 215 BC. ^ Xin 2004, p. 90. ^ Xue 1988, p. 19. ^ Xin 2004, p. 93. ^ Hsu 1999, pp. 546–547. ^ a b c d e Fan. ^ a b c d Xue 1988, p. 20. ^ a b Di Cosmo 1999, p. 921. ^ Lewis 1999, p. 596. ^ Xin 2004, pp. 90–91. ^ a b Xin 2004, p. 91. ^ Di Cosmo 1999, p. 961. ^ a b Xue 1988, p. 22. ^ Lewis 1999, p. 603. ^ Xue 1988, pp. 22–23. ^ a b Di Cosmo 1999, p. 887. ^ a b Xue 1988, pp. 19–20. ^ Di Cosmo 1999, p. 922. Fan, Ye. "後漢書：西羌傳 Hou Han Shu: Xi Qiang Zhuan" [Book of the Later Han: Treatise on the Western Qiang]. Chinese Text Project. Retrieved 2017-11-29. Sima, Qian. "史記 Shiji" [The Historical Records]. Chinese Text Project. Retrieved 2017-11-29. Di Cosmo, Nicola (1999). "Chapter 13: The Northern Frontier in Pre-Imperial China". In Loewe, Michael; Shaughnessy, Edward L. (eds.). The Cambridge History of Ancient China: From the Origins of Civilization to 221 BC. Cambridge University Press. pp. 885–966. doi:10.1017/CHOL9780521470308.015. ISBN 9781139053709. Hsu, Cho-yun (1999). "Chapter 8: The Spring and Autumn Period". In Loewe, Michael; Shaughnessy, Edward L. (eds.). The Cambridge History of Ancient China: From the Origins of Civilization to 221 BC. Cambridge University Press. pp. 545–586. doi:10.1017/CHOL9780521470308.010. ISBN 9781139053709. Lewis, Mark Edward (1999). "Chapter 9: Warring States Political History". In Loewe, Michael; Shaughnessy, Edward L. (eds.). The Cambridge History of Ancient China: From the Origins of Civilization to 221 BC. Cambridge University Press. pp. 587–650. doi:10.1017/CHOL9780521470308.011. ISBN 9781139053709. Xin, Di (2004). "义渠考 Yiqu Kao" [Researching the Yiqu]. 内蒙古师范大学学报 （哲学社会科版） Journal of Inner Mongolia Normal University (Philosophy and Social Science edition). 33 (6): 90–93. Retrieved 2017-11-05. Xue, Fangcheng (1988). "义渠戎国新考 Yiqu Rongguo Xinkao" [New Research on the Yiqu Rong State]. 西北民族学院学报 （哲学社会科版） Journal of Northwest College for Nationalities (Philosophy and Social Science edition). 2: 19–24. Retrieved 2017-11-05.